Winner of the Bronze Award! We are pleased to announce that Frako LKT DD60 Capacitor Line is the Bronze Winner for Consulting-Specifying Engineer 2017 Product of the Year! Video: 2 reasons why the new capacitor design won the Bronze Award 2017 Product of the Year. The unique design takes into consideration reactor voltage boosting and harmonics on the electrical system! The LKT…Type DD60 features flexibility by offering ratings that can be used with or without a reactor. Fewer capacitor SKUs are needed. The unique design takes into consideration reactor voltage boosting and harmonics on the electrical system. The new DD60 capacitors are designed for real world conditions such as high ambient temperature (up to 60°C continuous) and high harmonic current. They can carry up to 165% of their nominal capacitor current, continuously giving high performance in harmonic environments. 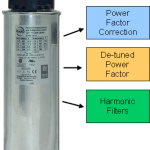 Continuous voltage capability of 110% of rated voltage makes them suitable for use either with or without a series reactor (tuning, de-tuning or filter). This unique rating is a first in power factor capacitor design and enables one capacitor to serve a multitude of applications. 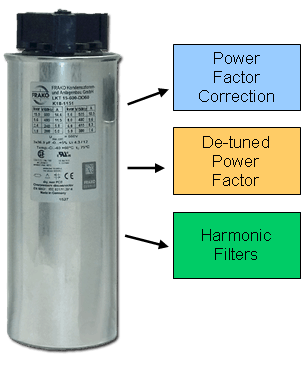 The DD60 capacitors allow for a reactor to be retrofitted into an existing power factor system to block harmonics and prevent resonance. They can be used with or without a series reactor in either power factor or harmonic filter systems minimizing stocking requirements. The LKT…Type DD60 3-phase dry-type capacitor is safer, stronger and flexible for solving power factor and harmonic filtering applications where high harmonics can destroy traditional capacitors. The Type DD60 ac power capacitor employs four degrees of safety plus patented design features that improve the reliability of capacitors in harsh environments. Contact to the internal windings is made by a patented, non-soldered contact ring to eliminate winding stress due to soldering. Self-healing film quickly isolates areas of dielectric breakdown in the winding when exposed to dangerous transient voltages. The segmented film completely removes a tiny section of film to prevent catastrophic failures due to severe transient voltages. Type DD60 are available in voltage ratings of 240/264, 480/528 and 600/660. Allied Industrial Marketing, Inc. is a Wisconsin-based company that specializes in power quality services and components to support the power quality industry worldwide. Formed in 2003 as an independent resource for power quality, Allied Industrial Marketing offers harmonic analysis, power quality diagnosis, filter design, Mangoldt reactors, Frako capacitors and educational power quality seminars. The company is a member of IEEE, AFE, WAEE, PFMA. For more information, visit our website at www.alliedindustrialmarketing.com.